Here are a few materials that may assist you in your efforts to promote a constitutional amendment to protect the flag from physical desecration. To help us record and report your petition to Congress quickly, please print the form and complete it in a legible manner. 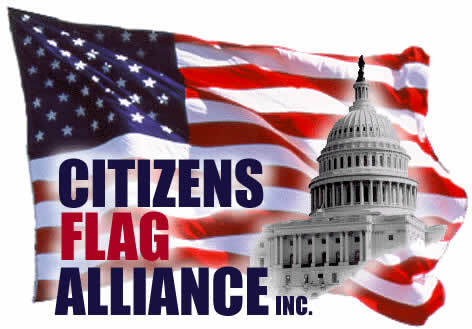 Citizens Flag Alliance, P.O. Box 361625, Indianapolis, Indiana 46236. You may download any of the artwork shown below for use on websites, in newsletters, or on any other materials in support of a constitutional amendment to protect our U.S. flag from desecration. To Download: Simply right click on the graphic of your choice. Choose "Save Image/Picture As . . ." from the drop-down menu. Choose a location and filename for the image. Click Save. It is simple to have a CFA banner on your homepage if you follow these 4 simple steps. (1.) Highlight the red text under the appropriate banner. (2.) Under the menu bar select Edit, then Copy. (3.) Open your HTML editor to where you want the banner placed. (4.) Go to Edit again, and then Paste.